Feel the feverish heat of Spain’s traditional dance with a flamenco show at one of the country’s most prestigious ‘tablaos’ (flamenco venues). Choose the show time that best suits your schedule, then make your own way into the heart of Madrid Old Town to enjoy a night of passionate flamenco. Depending on the option selected, sip on a welcome drink or sink your teeth into three or four delectable courses of authentic Spanish cuisine. Then, grow giddy as you watch an electrifying performance from some of the country’s leading dancers. Choose the show time most convenient for you, then make your own way to Corral de la Morería in Madrid Old Town. One of the most prestigious flamenco stages in Madrid, Corral de la Morería has showcased some of the country’s leading flamenco dancers for almost 60 years. As you stroll through the narrow streets of Madrid Old Town, gaze up at the Arabic corbels and the streetlamps that date back to the 18th and 19th centuries, and find yourself transported back to a time when flamenco was only just beginning to make its mark on Spanish culture. Perhaps pause for photos by the neighboring Royal Palace of Madrid, then head inside Corral de la Morería. Feel your excitement build as you make your way across the floor toward the rustic stage and sit down at your optimally placed table. As you take your seat, scan the crowd for recognizable faces — the likes of Jennifer Aniston, Natalie Portman, Jude Law, Sandra Bullock, Muhammad Ali and Omar Sharif (and formerly Marlene Dietrich and Marlon Brando) have all been spotted here. If you have opted for the drink and show option, sip on your glass of beer, wine or soda and watch as the tables around you fill up with excited guests. Alternatively, if you have opted to enjoy a 3-, 4- or 5-course dinner before the show begins, sink your teeth into dish after dish of tantalizing traditional fare, washed down with mineral water and wine. See the Itinerary for the sample menus. When the time comes, hear the roar of applause as the bailors (flamenco dancers), singers and guitarists take to the stage. Feel your eyes whiz back and forth across the stage in an effort to keep up with the fast-paced choreography, and stamp and clap along as you revel in the incredible elegance and passion of this heated dance. 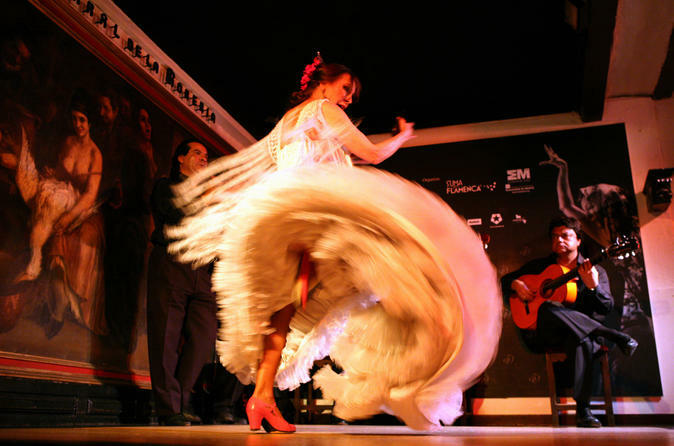 After just over an hour of flamenco, your experience concludes inside Corral de la Morería.